I sometimes tell people that when technology evangelists espouse that their tool saves you time, that it’s a red flag warning / code talk for “I am lying”. But here, I share my one, career tested exception; it’s old technology that many people have abandoned. I will wade carefully through the acronym jargon, but it’s using an RSS Feed Reader to monitor the most recent news, blog posts, data from sources you choose to follow, not dished out by some algorithm. I am going to mostly skip talking about what RSS is beyonds a lightweight summary of web site news stories / blog posts. 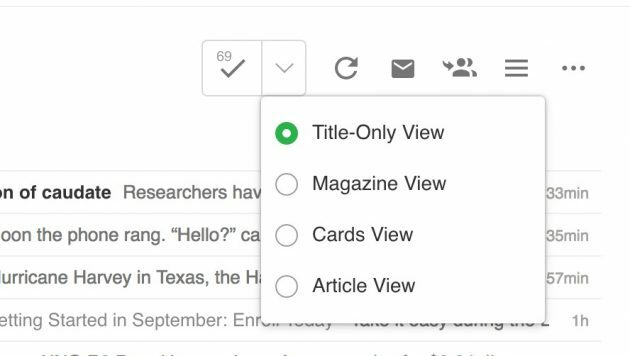 An RSS reader allows you, in one interface, to quickly skim the recent publications for mayne 100s of web sites.. without having to visit them. Clutter, noise, distraction. What you get is interspersed with many things that are outside your interests, rants, yelling, silly gifs. That’s a lot of filtering. You Miss It, You Lose it. Social media is focused at the head of the stream. While you sleep or actually do something productive away from social media, it all flows away. Yes, maybe your network can signal with repeating important things, but its spotty. Duplication You have no means to quickly know what you have already looked at, and you see may the same story multiple times. You Are Subject to Algorithms Especially on facebook, what you see is determined by the mysteries of an algorithm. Sure you choose sources by followers, but the means by which information is presented is determined by some outside automated entity. There are a number of Feed reader tools to choose from, and I am not going to advocate any as “best” — they all more or less perform the same function. 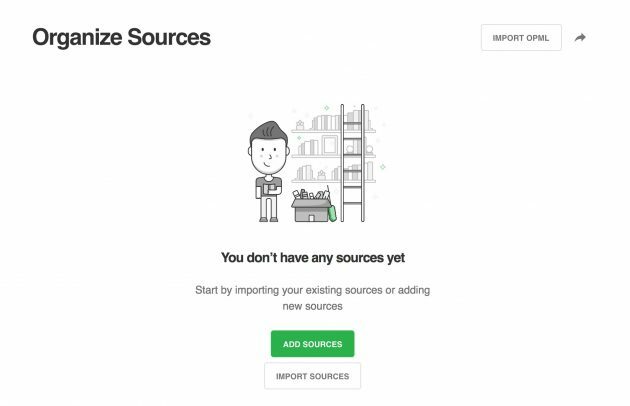 What’s more important is knowing (a) how to build your sources; (b) how to logically organize them; and (c) optionally how to curate items out of the big pile. Personally I use Digg Reader for my own perusing; mostly because it has become familiar, intuitive, and is not broken. Well now it is broken; I’ve moved to Inoreader .But I am going to explain how to use another one, Feedly, as I typically set it up when I am teaching a new course where my students will be blogging. If you teach a class where your students blog, it can be quite a chore to systematically, check 10, 20, 30 or more blogs on a regular basis. And yes, while I often build WordPress based aggregator sites, that’s still not quite efficient for regular review when I am teaching. 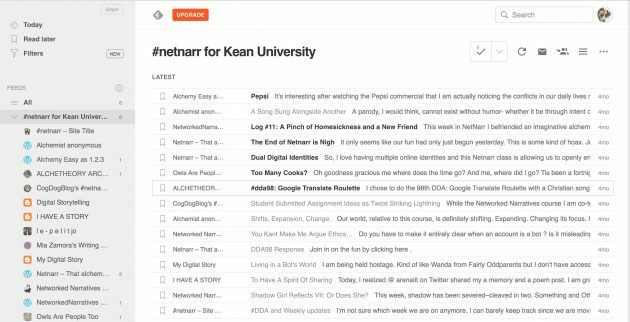 Just to make it more clear why I see this valuable, here is a look at my Feedly with subscriptions to the blogs from students in the Spring 2017 Networked Narratives course. On the left are the listings of the 20 blogs, but by viewing them at the “Collection” view (like a folder) on the right I can see the latest posts from all blogs. At a glance I can see ones I have not read as the titles are bold. I got a range of sharing options, but this way to page through posts… saves time. Now I may want to leave a comment, or maybe see how it looks on their blog, so I can just click the title of the post in expanded view to visit the site. 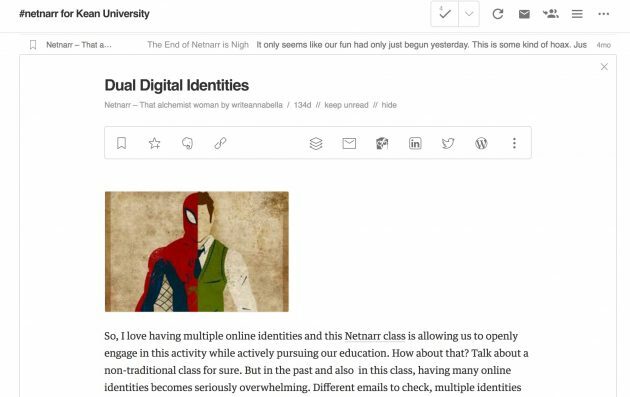 That’s the view of the whole class, if I click one student’s blog title on the left, I can again, quickly see the activity for that one student, and ones I have not read again are bold. The feed view from one student blog. If I go to their site, I’d have to remember in my head if I read a post. Can you really do this better in twitter? Good luck. 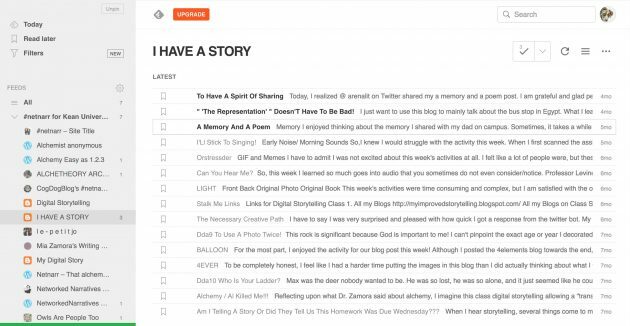 I am also skipping another level of time saving amazement; for all my student blogs (ones using WordPress or Blogger) I have a matching set of information on the comments on their blog. IN the same ways, I can see and review the comment activity on all my student blogs or down to one single blog. Again, if you do not see the way this saves time, feel free to close this window now. Have a nice day. Now to try Feedly, just go create an account there (I use my gmail account to login). Now it’s going to be empty and they will ask you to add sources. You start with no feeds! Now take a breath, here comes a few more acronyms. I will explain how to make these latter, but there is an additional data file format called OPML (not even worth saying what it stands for, it’s in XML format- oh no that is my third acronym, I am done). It’s more or less a package of subscriptions to feeds you can add at once, and will automatically create the grouping like you see in my class ones above. Now an important thing I forgot to mention AND IT ALSO SAVES TIME is, once subscribed, Feedly will automatically update your stuff while you are away. You can set this as a preference, and many more ones I’m skipping if you click your icon in the top right and select Preferences from the menu. So in my upcoming thesis seminar class, I will import an OPML file for all the blogs from my Kean students (not yet available) and maybe a second collection for the students in Mia Zamora’s DIKULT 303 class at University of Bergen. But for your own research or interests, you will build your own set of feeds. 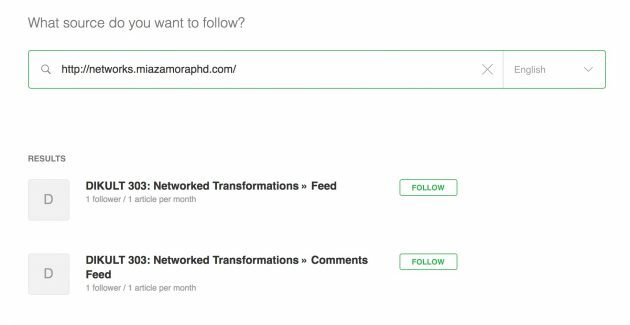 In Feedly, click the green Add Content button in the bottom left, and select the option for Publications and Blogs. which is like a folder or group. So I might make a new one called “Research”. The next time I add a new feed, Research will be available as an option. For my Kean students, I will be expecting them to develop their own collection of feeds relative to their thesis topic or interests. There are a number of curation featured available, most noticeably “Boards” which you can individual items yo as you read, using the star button, this is a curation method that you can use to pull things of interest from many different sources. Feel free to disagree with my time saving assertions, but I have years of experience as confirmation. But go back to trying to get all your key news from social media and tell me how that is more efficient. Oh, one more thing, how do you create those subscription files? Many ways. In Feedly, go under your account icon and look for organize. Select the feeds you want to package, and click the small arrow button to the right of Import, this leads to an export option, or directly https://feedly.com/i/opml. The limit here is you will export all your subscriptions (which can be handy if you want to try another feed reader). What are you waiting for now? 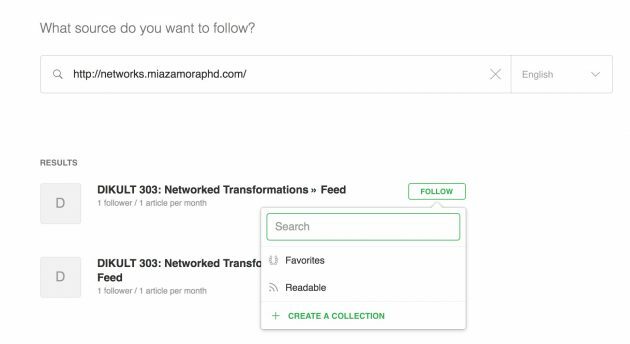 Set up your Feedly and start saving time (well unless you spend more time reading cool stuff you find). If Dave only had an RSS Reader where he could have read this, he might not have tweeted. So… I'm over obsessively reading about how our world is getting weird, and I want to start reading other people's work again. 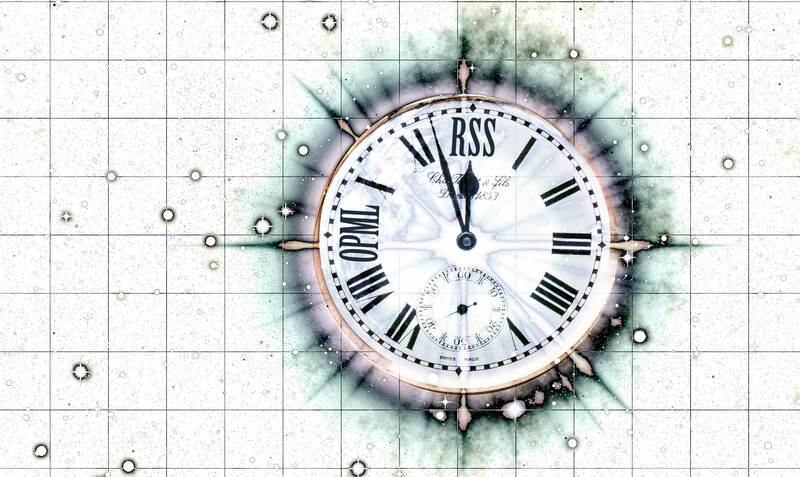 I hear RSS is dead. Everyone is stealing my data. Does anyone have a good plan on how to read other people's work other than catching it on twitter? – the limits associated with a free accounts. If you are starting a new account now I think that there is a limit of 50 feeds. – free accounts are somehow tapered or something. There are quite a few blogs (Maha Bali’s, yours, Doug Belshaw’s, Jim Groom’s) that come through in batches. Not sure if there is some technical reason for this stuff. I just write it off on the weird stuff the web does. Thanks Aaron… I’ve not used Feedly intensively, so it’s good to know the limits and glitches. They do seem to want to upsell you at every turn. And at least you can export subscriptions and try other platforms. I love Feedly, and have been using it since the death of Google reader. I didn’t know about the limit, though: I never felt it. I’m also using Digg Reader, and I like it, it’s very lean. What I love about Digg reader (and that Feedly does not allow) is it can generate a couple of RSS feeds from one’s favs or so. To do that with Feedly I have to pipeline IfTTT too, until I forget what I’m doing. The limits on Feedly are recent and only apply to new users (http://www.freetech4teachers.com/2017/02/feedly-limits-new-users-to-100-feeds-in.html). I’m currently using feedhq.org as the backend, and various apps on my devices (newsbeuter from the command line and Reeder on my iPhone). Works well for me, but probably not something most people would want to set up. Yes, I don’t think the platform matters much as the practice. As long as I can read, short cut key move through things, see what’s new, I’m pretty happy. Hmm, I’ve never even thought about reading oldest first. Feedly seems to want to upsell on features. This was a very timely and useful post for me, and I’ve reused it pretty much as is at create.twu.ca/orientation/curating-u. The content for this page is being fed from GitHub. Something seems off though. The link in your post to the OPML file works fine, but the same link in my page, with an identical URL, leads to an error. Any idea what might be happening there? I was missing a closing &lt;body/&gt; tag. On my site I trigger the link as a download using the option in the href link (likely stripped out on GitHub pages.